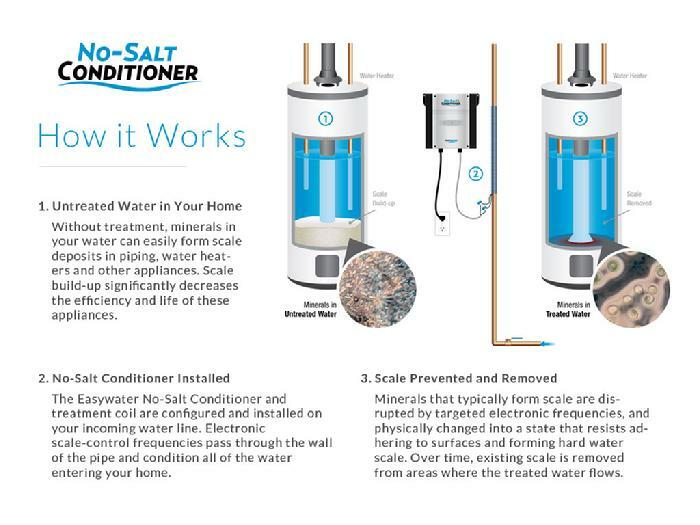 Easy Water 's No-Salt Water Conditioning System uses electronic frequencies to physically change the shape and charge of the minerals in water, which prevents scale buildup. Within the first 2 weeks you can expect that soap will lather easier, spots on dishes will be reduced or eliminated, and detergent and soap amounts can be reduced 25% or more depending on water hardness levels. In the first 90 days you will notice scale deposits start to loosen and breakdown from your pipes, water heater, and other water appliances. You will also notice clothes will feel softer out of the laundry, and mold and mildew will begin to disappear. Long term benefits include: No salt to buy, the inside of your water heater and pipes will be de-scaled, your water heater will last significantly longer due to lack of scale deposits, the elimination of scale will also reduce your energy bills, appliances in your home will last longer, and your clothes will last longer by reducing the damaging effects of hard water. Unlike salt type softeners that replace the beneficial calcium and magnesium with two times as much sodium, Easy Water keeps these minerals in the water. Easy Water Bacteria Shield Water treatment is simple but powerful. Bacteria Shield provides protection against up to 99.9% of E. coli waterborne pathogens and other bacteria. It's natural process won't alter the taste, odor, or ph levels. This is a great defense if your water source comes from a private well, community well, if you have older water lines, or if you just want the peace of mind knowing you have an extra defense system. 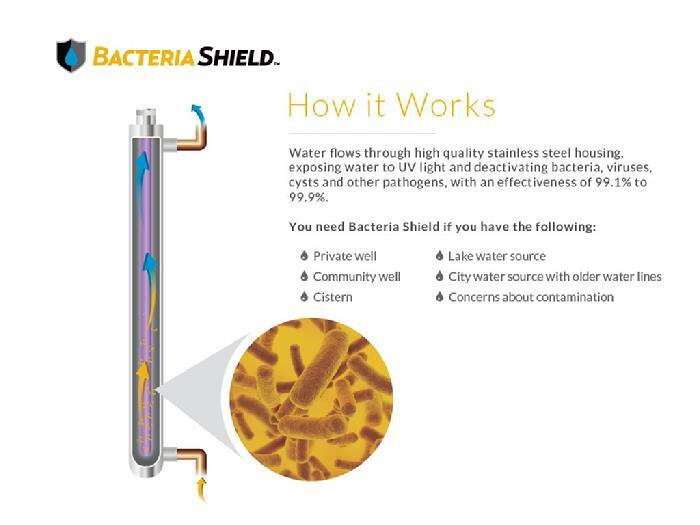 Bacteria Shield is also safe for septic systems, plumbing, and appliances. 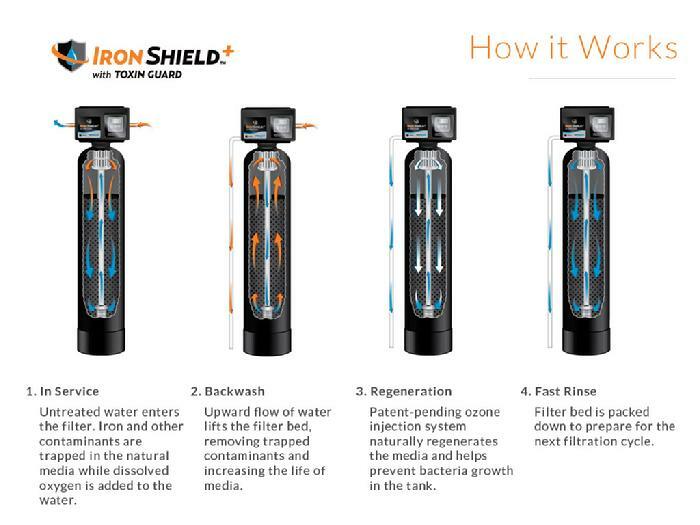 Iron Shield eliminates stains, discolored water, and odors with the oxidative power of air. This is a natural process, which is healthier for you and better for the environment than using chemicals or salt. Iron Shield protects bathing, showering, and cooking water against common toxins that can be absorbed through the skin or inhaled in moist air. 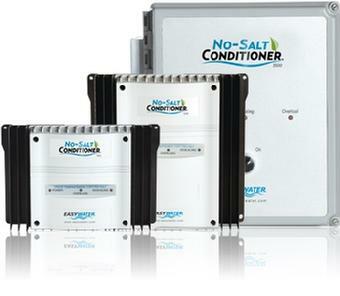 It removes iron, manganese, hydrogen sulfide gas, and many other unregulated water toxins. By using Iron Shield you will no longer have the rust that causes orange stains on laundry, and it will also eliminate the sulfur that leads to rotten egg odor. It is also saves pipes and plumbing fixtures against corrosive iron build up. 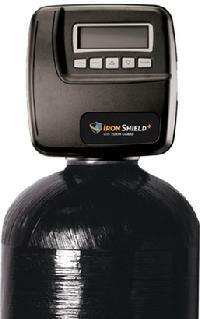 Iron Shield is safe for septic systems, plumbing, and other appliances.